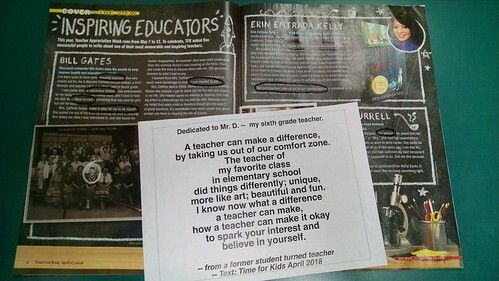 This week is Teacher Appreciation Week, and the cover story in a recent edition of Time for Kids magazine were small vignettes written by famous people about their favorite teachers, and the impact those educators have had on their lives. I saw an opportunity to teach my sixth graders about Found Poems (and hope to do Blackout Poems some other day), of remixing words and phrases from a text to create a poem from inside the passages. My students enjoyed the poem I wrote. I did, too. Aside from making mustaches and other cosmetic choices on the magazine images with the Sharpies I gave them as I read the vignettes out loud, they dove in to find interesting phrases and words as they began to make a gift of a poem to a favorite teacher in our building as a token of appreciation. They will be doing final versions of the poems today, and then decorating envelopes tomorrow, and I hope the found words help them express their feelings about former teachers. The few student poems that I saw being worked on yesterday were pretty powerful. I hope they send a message of appreciation from sixth graders, about to leave our elementary school, to their recipients, my colleagues in the building. This entry was posted in my classroom, Poetry. Bookmark the permalink.